hen the Parker Arrow was discontinued in learly 1988 the Parker "95" was introduced to replace it. It sported the stylized arrow clip without tines, also used on the Parker "88", held down by a medium sized gold filled "2 coin" cap screw. The nibs on the fountain pens where gold plated stainless steel, semi-wrapped and semi-hooded under a rounded black section. It also had a broad body ring, wider on the laquer pens than on the "Insignia", which in turn had a smoother area on the cap lip sporting a Parker imprint., and the pen took cartridges or converters. It was offered as a fountain pen, roller ball, twist actuated ball pen and pencil with 0.5 millimeter leads. "Insignia" 23k gold filled with a stripe Fileté pattern. This remained in 1989. 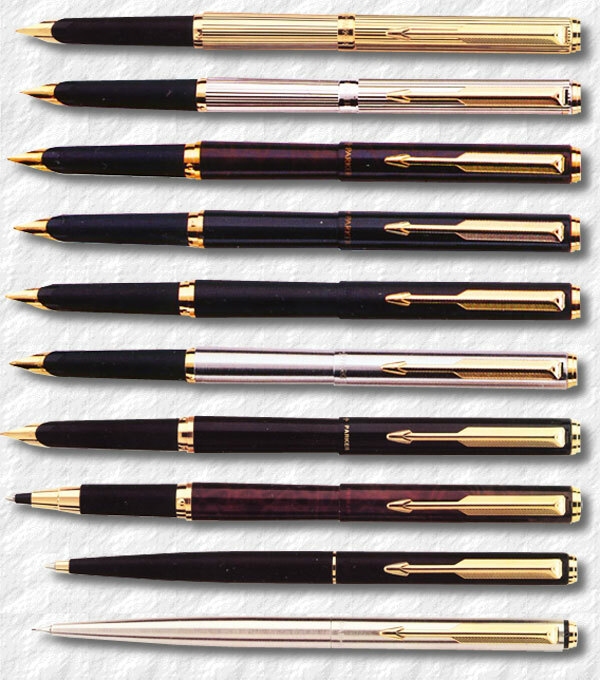 The Parker "95" was made in the UK, the US and also i Merú, France. In the UK in 1990 a Flighter with chrome trim was introduced (CT). "Insignia" $90 (£60), Laque $65 (£50), Matte $55 (£40), Flighter GT $40 (£25) and Flighter CT (£20). The roller balls, ball pens and pencils were priced 60-70% under the fountain pens. In 1992 a silver plated brass Fileté with gold plated trim was introduced. The prices were also updated: "Insignia" $95, Laque $75, Matte $65 and Flighter GT $55. An uncommon, plain, gold filled version was introduced in 1993.
he Parker "95" was phased out before the summer in 1994 to give way to the Sonnet. Like their tactic in the early 1920's Parker decided to slim down the model range and concentrate on a few designs, also slimming down the cost of manufacturing. Like in the car industry, it's cheaper to make one-part-fits-all, than a multitude of parts in small numbers. Enter the Sonnet. One design in a wide range of finishes and pricing. Thus the Parker "95", the Premier and the fabulous Parker "75" was hand in hand lead into a production obliviance. and an assortment of roller ball, ball pen and pencil, 1992.